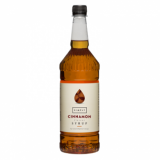 Monin Cinnamon (Cannelle in French) syrup in 1 litre plastic bottle. This fragrant spice flavour evokes dreams of hot cinnamon rolls from the oven. 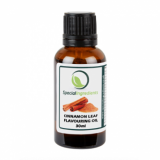 Derived from the bark of an evergreen tree native to Sri Lanka, cinnamon is one of the oldest spices known. Among ancient nations, it was so highly prized that it was regarded as a gift fit for monarchs and other great potentates. Throughout history, cinnamon's popularity continued. The characteristic rich, warm and sweet fragrance of cinnamon made it one of the most evocative spices and a much used ingredient in many cuisines worldwide. Cinnamon is used in cakes, cookies, and desserts. It goes well with apple flavour. Use also MONIN Cinnamon to bring fragrance to your hot beverages. Applications: Teas, coffee, cocktails, flavoured milks, smoothies. Sugar, water, natural cinnamon flavouring, concentrated lemon juice, colouring agents: caramel E150b, E163, Preservative agent: E202.